Javier de las Muelas, founder of Dry Martini Barcelona - voted one of the top ten bars in the world for the last six years - has spent two years creating the innovative DROPLETS. The range has created a new category for the world's best bars and kitchens aspiring to reinterpret high quality dishes and cocktails with pioneering natural, authentic ingredients. 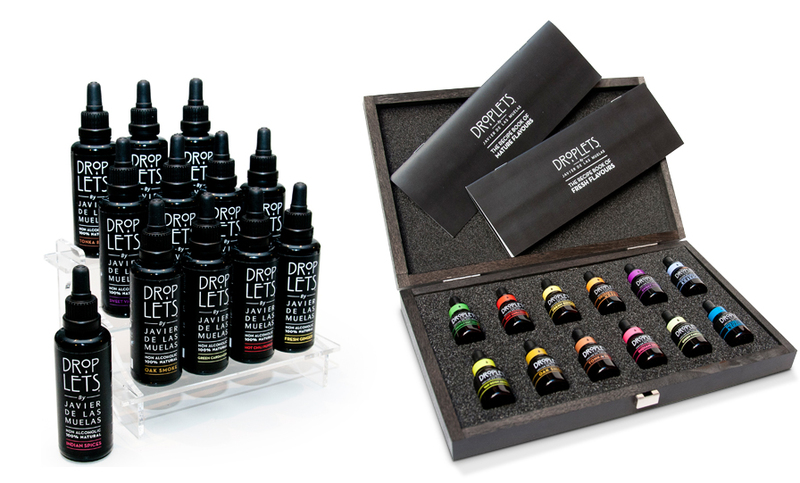 DROPLETS are 100% natural, alcohol free flavours. Just three Drops create endless gastronomic possibilities. OAK SMOKE: This Droplet has endless applications; it provides a balanced smoky oak intensity which can be used in tea, rum cocktails, in a whisky blend or as seafood seasoning. VAN GOGH ABSINTHE: This legendary distillate has an attractive aniseed flavour. This Droplet allows this unique flavour and scent to be added to cocktails and traditional dishes, without adding alcohol. INDIAN SPICES: This Droplet has all the aromatic intensity of using the traditional spice, but does not add texture or saltiness. Perfect for use in teas, juices, long drinks, soups. DARJEELING TEA & CHAMOMILE: Created to enable a simple and accurate way to add a defined and elegant taste of tea and chamomile. For fruity or floral cocktails and cut fruit, sorbets and sweet creams. HOT CHILI PEPPER: Clean, crystalline, without vinegary notes, this Droplet offers a spicy taste that evokes freshly cut jalapenos. Serving the Drops accurately, the creations will always have a balanced aroma and spice. FRESHLY CUT CELERY: Freshly cut celery turned into flavourful Drops. Perfect for use in teas, juices, Long Drinks, soups..
ORANGE BLOSSOM HONEY: Giving the ability to add honey in a significant way to recipes that are not sweet. Develop a Honey Martini that is perfectly dry or serve a Whiskey highlighted in delicate notes of honey but not sweetened. TONKA BEAN: Almond, vanilla, cloves and cinnamon. Delicious in drinks containing aged distillates, tropical fruits like passion fruit or cakes and biscuits. SWEET VIOLETS: Reproducing the intense violets’ flavour in a single Drop. A delicious aroma which makes delicate Gin & Tonics or floral cocktails without adding sugar. Also useful spirits or syrups, and an ingredient in baking. MEDITERRANEAN ROSEMARY: Using this Droplet allows you standardise the intensity with this usually challenging herb. FRESH GINGER: This Droplet accurately reproduces the flavour and aroma of freshly cut ginger, with the advantage of using an exact number of Drops, as ginger is a difficult ingredient to add accurately. GREEN CARDAMOM: A popular flavour in the current cocktail world. Combine it with green apple, passion fruit or rum blends. The easy application allows for this spice to be integrated in a range of cocktails, instantly and accurately.